The beginning of August 1914 on the Western Front saw the great German march begin, when the German Fourth Army violated the neutrality of tiny Luxembourg, in an attempt to secure important railways needed to complete its war mobilization plans. Across the border, Belgium suspected that they were next. Ahead of Germany’s invasion into Belgium, the Belgian army systematically began blowing up important bridges and rail installations in an attempt to slow the Germans. This strategy and Belgium’s dogged resistance bought the Belgian army time to retreat and eventually enough time for the British to bump into the Germans later in the month at Mons. 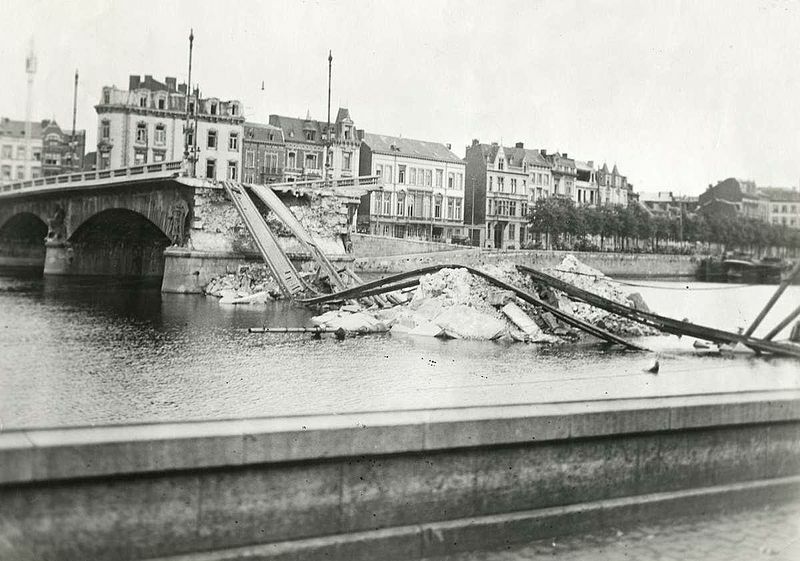 A tactically destroyed bridge in the centre of Liege. It has been noted previously in this series, that the Germans had planned long ago to march westwardly with their armies through Belgium, before eventually swinging southeast towards Paris. In theory, the Schlieffen Plan was envisaged as a ‘lightning war’ to knock out France before refocusing their attentions east along the Russian border. However, before they could entertain any thoughts of conquering Paris, the city of Liege had to be taken first. Liege had two decades earlier built a ring of twelve forts that would protect the city and Belgium’s neutrality. The strength of these forts, all made from reinforced concrete and armour-plate, in theory was supposed to repel any attack. Additional troops would also play their part by digging trenches between the forts to strengthen its line of defences. At the turn of the century, these immense fortifications were strong enough to withstand an artillery barrage. However, with the improvements made in heavy artillery just prior to the war, the Germans task to capture the forts was made a little easier. Though first they had to get there and they did so with very little resistance. Crossing the border into Belgium on the 4th August, it took the German armies only two days to capture the city of Liege. What must have seemed like a stroke of luck, General Erich Ludendorff’s Second Army found itself in the centre of Liege and in possession of the city’s citadel. It must have felt quite strange being in control of the city but not the surrounding fortifications ? 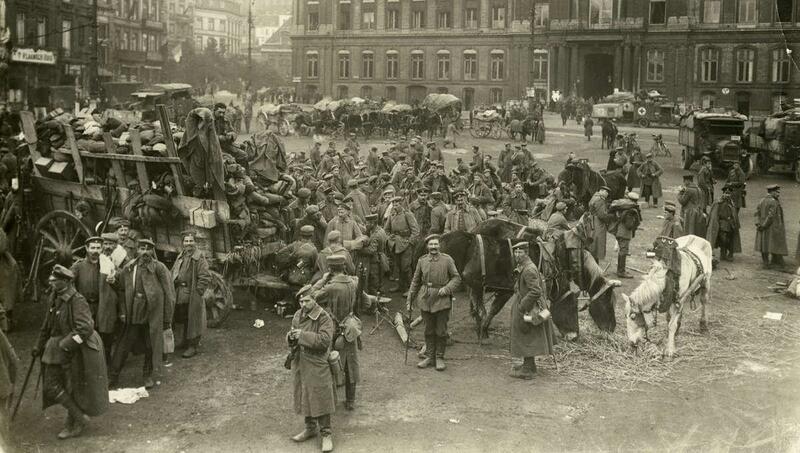 German soldiers outside the Palace of Prince Bishops in Liege 1914. Upon hearing that the city had fallen to the Germans, General Gerard Leman of the Belgium army, ordered a whole division to withdraw out of the Liege vicinity and join the retreating Belgian army. He, himself, refused to surrender and remained defiant ‘holed up’ in Fort Loncin, one of the twelve forts still resisting submission. Germany’s provisional commander of the Liege siege, Otto von Emmich appealed to Leman to surrender but Leman was determined to hinder German progress at all costs. So, began the siege of Liege as heavy artillery bombarded Liege’s fortifications for days on end. Progress at first was slow and it wasn’t until the heavier 420mm howitzers were brought up to overwhelm Leman’s stubborn forces that Germany’s fortunes began to change. 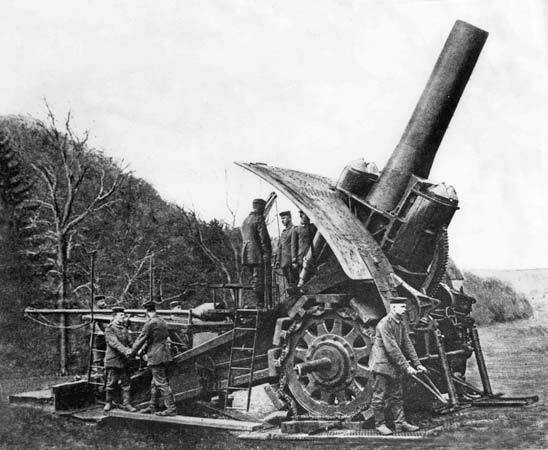 The German 420mm Big Bertha howitzer. The siege of the Liege Forts would become the springboard for Germany to continue its summer offensive throughout the rest of August. They had also discovered how effective their huge howitzers had become in obliterating the forts at Liege and would use these guns to similar effect at Namur. These ‘secret weapons’ or guns would come to be known on the western front as Big Bertha. Propaganda postcards like the one in the header image above of the destroyed Fort Loncin also did much to establish the 42cm howitzer as the ultimate weapon of terror in 1914. 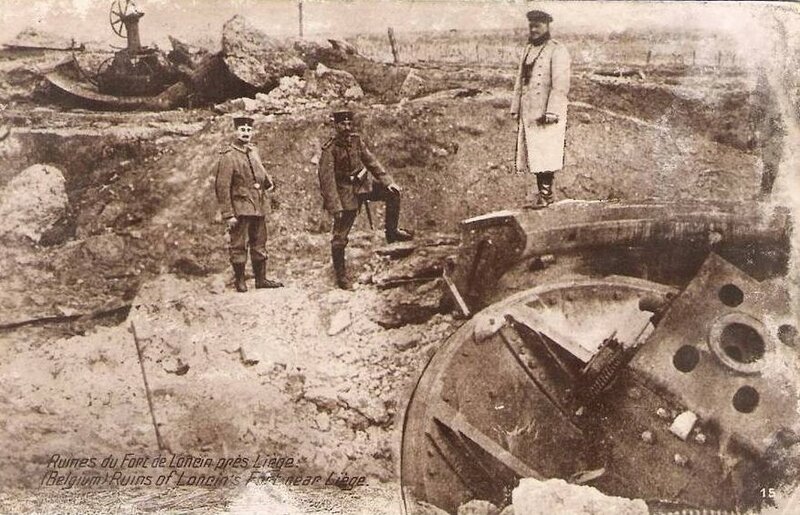 German soldiers posing on the devastated site of Fort Loncin. Photo credit: All images are in the public domain. The header image is a German propaganda postcard of the ruin of Fort Loncin. Robert Horvat is working his way through the First World War one blog at a time, usually following the centennial dates. Today he takes on an important event early in the fighting, the siege of Liege. A must for any WWI buff! I was at Namur last year and saw the exhibition of the construction of the forts around the citadel – and the account of their destruction in World War One. I could not believe how men could have survived in the gas and dust of those explosions…and walking through those galleries linking the forts….like walking though a catacomb. Thanks you for your contribution Helen. Today Namur is quite picturesque, though you wouldn’t have known that in August 1914. In fact, I believe Namur suffered heavily from destruction in the Second World War too.